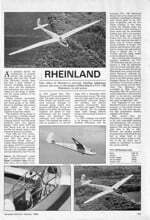 The story of the Rheinland seems to have begun in 1932 when a student member of the Academic Flying Group of the University of Aachen, known as the FVA (Flugtechnischetireinigung Aachen) decided to design and build a sailplane for his Diploma thesis. His name was Hens Sander and we are very honoured to have him as one of our members. In undertaking such a work, Hans Sander was responsible for giving a new impetus to aircraft design activities at the University of Aachen. No aircraft had been designed and built by the FVA since 1926. Before that time, the FVA had known a period of glory marked by such famous designs as those of the “Black Devil” of 1920 and the FVA2 “Blue Mouse” of 1921. These two gliders had not only set up world records, but had largely helped to start gliding in Europe. Since 1926 however, the students of the FVA had shown more interest in flying than in designing with the result that their Association had become more of a flying club. 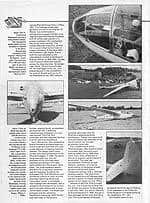 Hens Sander named his glider the Blue Mouse 2 in an effort to remind the FVA of its post glory and to rekindle an enthusiasm for gliding. 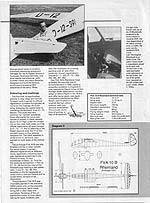 He certainly succeeded, for after his glider the FVA 9, came the FVA 10A in 1935. This was named the “Theo Bienen” in memory of an FVA test pilot killed in 1926. In 1936 came the first FVA 10B. It was named the “Rheinland” after the FVA 5, a successful single-seater produced in 1923, which had also been named the “Rheinland”. The enthusiasm triggered off by Hans Sander lasted until the end of 1939, by which time the FVA had designed, built and test flown three more impressive sailplanes. The outbreak of war put an end to this fruitful activity and many FVA members were called up as troop carrying glider pilots. It is only right tbat Hens Sander, being the man who started the enthusiasm which produced the Rheinlnnd, should tell his own story. “I happen to be an Honorary Member (Alter Herr) of the FVA which was initiated by Prof. von Karman and his Assistant, Wolfgang Klemperer (who were respectively responsible for the design and test flying of the original Black Devil and Blue Mouse – CW). 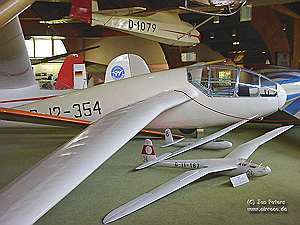 We had abandoned design of gliders and light aircraft after 1927. 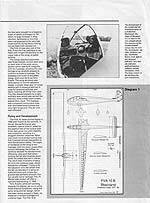 However, in 1932 I was responsible for the layout of the FVA 9 (The Blue Mouse 2) and my diploma work not only contained the calculation for lift distribution and a complete stress analysis fop the wing (equal stress, which made it possible to build this 16m span ship with an empty weight of only 92kg), but also a stability analysis. 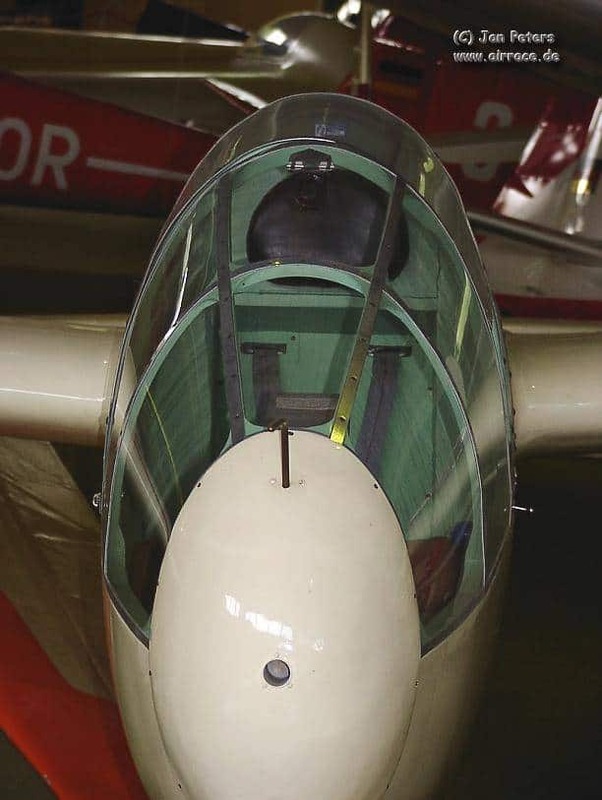 The ship already had a contracted fuselage aft of the wings, (which reminds one of today’s glass fuselages – CW). I did not like to accumulate surface drag and weight after wind tunnel tests had shown that the streamlining was good and that no flow separation occurred. “Unfortunately, we didn’t have a pilot to win with this ship”. This last statement referred to the eventual destruction of the glider on landing. 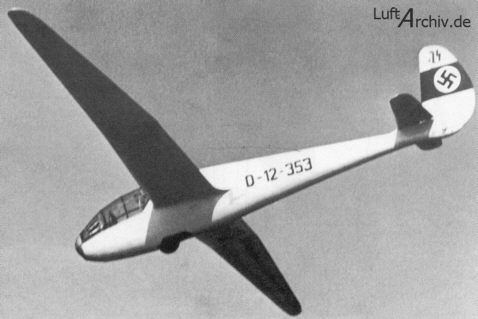 The next sailplane of the Akaflieg Aachen was the F.V.A. 10, the Rheinland. It had a. better fate and crossed the Alps in 1936. It’s handling characteristics were even better than its predecessors. It’s designer was Felix Kracht, who is today one of the senior men in charge of the Airbus in Toulouse. “You are lucky that the designers of both the FVA 10A and the FVA 10B are still alive ( … ). 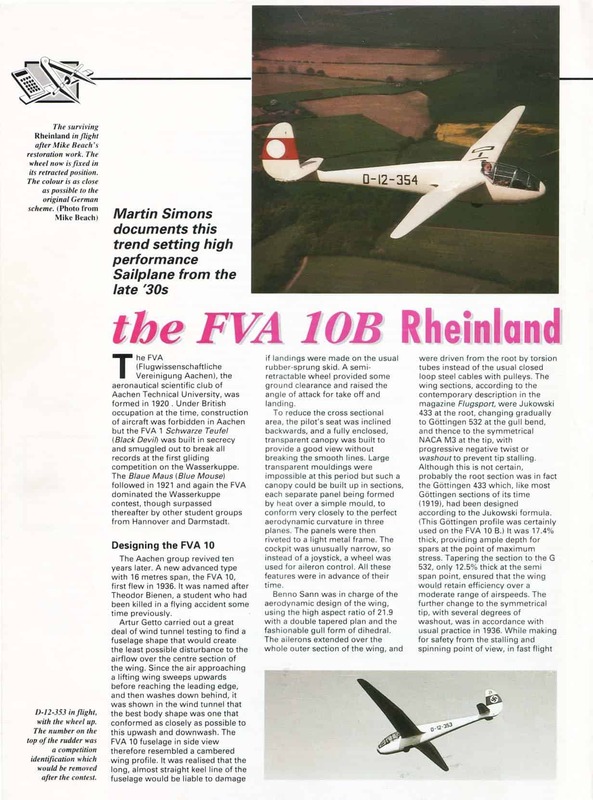 “From memory I can tell you that the FVA 10A was designed by Artur Getto and Benno Sann around 1935, while the FVA 10, the Rheinland, was designed by Felix Kracht, who is now Production Manager of the Airbus. Having gained his Diploma (Master’s Degree), Felix joined Mr. Schmetz at Herzongenrath, Aachen, in order to produce the Rheinland in series. After leaving the FVA, Hans Sander became Chief Engineer and Chief Test Pilot for ground and flight testing of prototypes at Focke Wulf from 1937 to 1945. He. is also a holder of three Diamonds (FAI No. 551). Here are now some extracts from a letter from Dr. Artur Getto to Chris Wills dated 16th February 1976. Dr. Getto helped to design and build the FVA 10 “Theo Bienen”, the forerunner of the Rheinland which it very much resembled. “Thank you for your letter. It is a final proof that the sins of our youth persecute us for ever!!!! “In answer to your questions, I will try to tell you the story of the Rheinland. “When I joined the FVA, a group of aeronautical students from the Technical High School of Aachen, they had just reverted to their initial task of developing ideas in aircraft design. The main promoters of this movement were Dr. Doetsch and Dipl, Ing. Hens Sander. They designed and built the FVA 9″?Blue Mouse 2”, a performance training sailplane (a fair improvement on the well known Grunau Baby.) which had very good performance and handling characteristics. With this experience, the Group intended to develop a high performance sailplane, and the main task was undertaken, after Boetsch’s and Sander’s departure, by Artur Getto and Benno Sann. 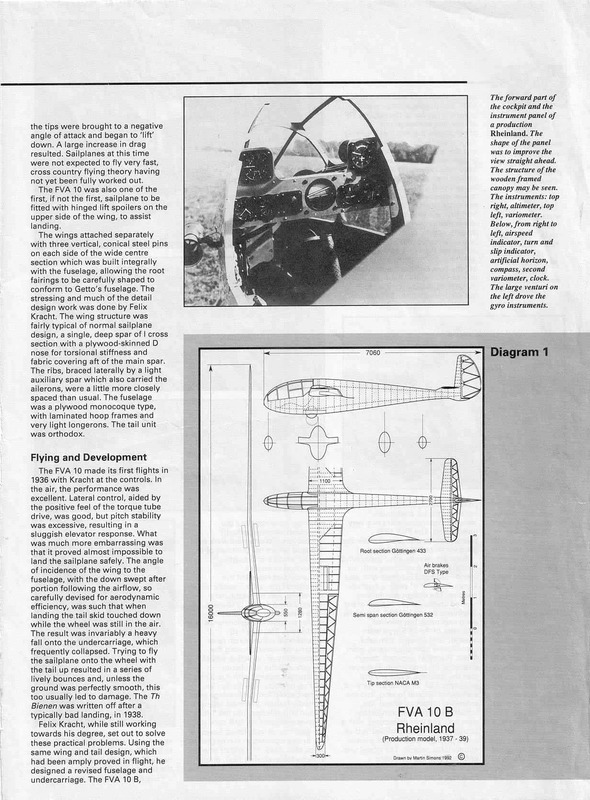 The main idea was to find the ideal wing/fuselage configuration with the intent to minimise fuselage drag and obtain a total CL/CD ratio which would be as high as possible. 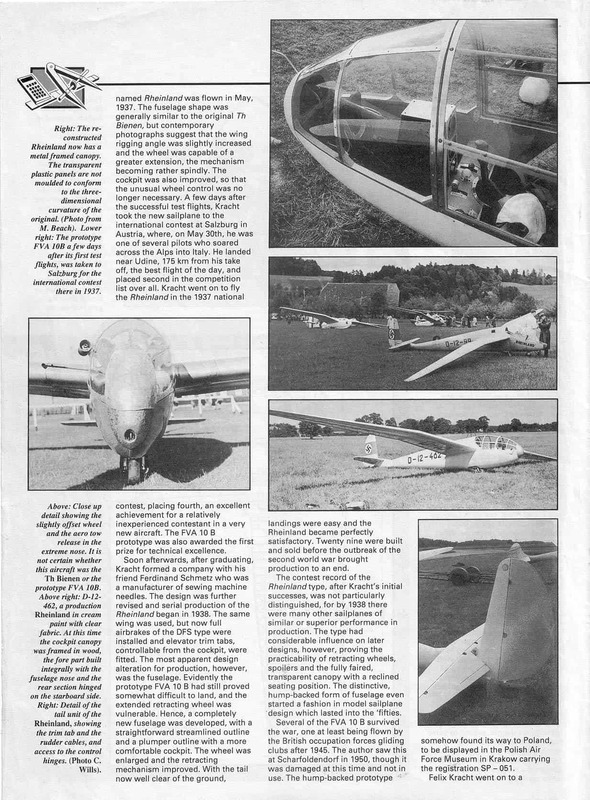 “During these many flights, I ascertained that the lateral control was excellent, but that the aircraft’s longitudinal stability was too high and the elevator’s response too low. In addition to this, the position of the pilot proved too tiring. But the biggest handicap lay in the “aerodynamic” shape of the fuselage. A correct landing was practically impossible at minimum speed because the tail touched the ground far too early and the spoilers which were to my knowledge the first devices of this kind, wore not efficient enough to overcome the inconvenience. So every landing was a hazard and about a year later, the aircraft was destroyed on landing by one of our less experienced members. “My friend, F. B. Schmetz, who had closely followed our flight tests and mountain experiences, encouraged me, during the autumn of 1936, to redesign the fuselage and to add some improvements to the wings as well. “In the meantime, the possibilities of our workshop had improved considerably. So, in October l936, my friend Franz Nekes and I started with the redesign, opting for some easier-to-build solutions and such new items as balanced air brakes, retractable landing gear with low pressure tyres, brakes and shock absorbers. But the essential thing was to redesign the shape of the fuselage to allow an easy landing at minimum speed, with or without airbrakes. This sailplane, called the FVA 10B “Rheinland”, was ready for its first test flight on 13th May 1937. There was time for only two test flights before going to Salzburg where we were to take part in the international ISTUS Competition of 1937. I ended in second place, the first going to my friend Ludwig Karch, from the Munich Group, with his famous 2-seater MU 10 “Milan”. During that time, the aircraft proved very manoeuvrable and I managed the first Alpine Crossing from Salzburg to Osoppo, near Udine. In July I flew the FVA 10B in the 1937 Rhoen Contest, again coming second to Ludwig Karch in the Mü 10. However, the FVA 10B won the Award for advanced design. 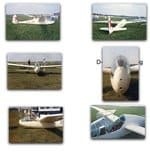 “The following year, our Group started the development of a new sailplane for very high performance, the FVA 11 for which I also designed the wing. At the same time, I was contacted by the German Aero Club with the request to put the Rheinland into production. But my first concern was to complete my Diploma. “Once more, it was my friend F. B. Schmetz who pushed me, and the day I gained my Diploma, we founded the company of “Schmetz und Kracht GmbH” in Aachen. During the spring of 1938, we started putting the Rheinland into production. Up to 1st September 1939, we had delivered 29 aircraft. I think that the one you have in England must be one of the last ten built. “With the beginning of the war, we closed our workshop and I joined the DFS (the German Institute for Gliding) where I remained until the end of the war. At the end of 1940, the German Government asked us to reopen our workshop and to build first the Meise (650 built) and later on, a special version of the aerobatic Habicht with clipped wings (Stummelhabicht) for training purposes. “Having myself other duties at the time, Schmetz took over the whole job and completely transformed an old workshop for knobs next to his needle factory into a very modern glider factory. We are very honoured indeed to have received letters from the actual designers of the Rheinland who, as very famous men, have found the time to write to us. We thank them very warmly. Hans Sander has kindly sent us a photograph of the FVA 10B which took part in the 1937 ISTUS Meeting It shows that the fuselage had not yet ‘been altered to that of the Rheinland in our drawing, which is the same as BGA 1711 currently flying in England. 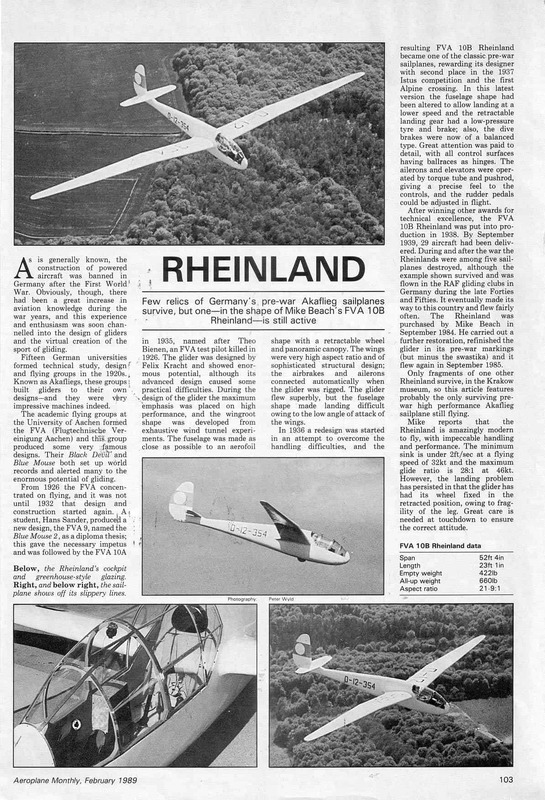 We also have a photograph of a Rheinland which flew in the 1938 Rhoen Contest. It has fully altered fuselage, like the one of BGA 1711. 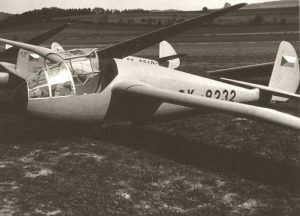 One therefore gathers that the first FVA had a similar, but improved fuselage to that of the FVA 10B. Two Rheinlands were entered in the 1938 Rhoen Contest. They ended 19th and 44th, contrasting sharply with the results obtained by Felix Kracht the previous year,. Those poor positions showed how keen the competition was. Felix Kracht took part in the event in the FVA “Eifel”, but he obviously had problems.. He ended in 52nd place and scored no points. The Eifel was an 18m wing span version of the Rheinland with fowler wing flaps and a max calculated L:D 1:33! The Rheinlands entered’ in the 1939 Rhoen Contest ended in 29th and 35th positions. The FVA 13 (the FVA’s Olympic Sailplane) came 27th. After 1945, according to some reports, 4 Rheinlands were used by the RAF in Germany. Another was being flown during 1947 in Czechos lovakia. Another ended in the Polish Air Force Museum in Krakow. To the best of our knowledge, only BGA 1711 is still airworthy. Although it never did so well in the Rhoen Contest as the magnificent Berlin B.5 and B.6 or Stuttgart’s FS. 18, the Rheinland now remains, together with the MU 13D and the MU 17, the only gliders stemming from pre-war German university groups still flying today. The ailerons and divebrakes are driven by steel torque tubes directly from the fuselage. This creates ultra effective aileron control. Coupling these tubes to pick-up points in the fuselage is done automatically. The main wing/fuselage bolts are tapered cones, which are drawn towards each other into the vertical holes in the main spar ends, by bolts. The aircraft is remarkably refined. Wing tip spar ends had to be made of a special compressed wood (Jabroc) as spruce or pine, used in such minimum dimensions, would not have been strong enough. Only the old, undercambered wing section betrays the fact that the machine might have been designed before 1938. The undercarriage of BGA 1711 is now fixed up. This gives little clearance between the bottom of the nose, and rough ground. In flight, BGA 1711 is a joy to fly. All controls are light and responsive even at speeds as low as 32 knots. This speed produces a faint buffet from the tailplane (or somewhere aft). BGA 1711 may fly as slowly as an indicated 30 knots but this may not be advisable as it is said that she will spin quite well if handled incorrectly. BGA 1711 is very quiet in flight and has cockpit refinements such as adjustable rudder pedals. Landing the Rheinland presents no problem, although the landing wheel is now fixed retracted. This causes the wing to be at a not very high angle of attack on landing. 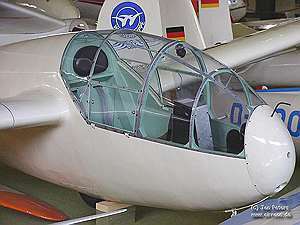 It was said in “Flugsport” that the original FVA 10 had a wing at a minimum angle of attack on the fuselage. Even with the landing wheel down, it was not possible to create a sufficient angle of attack on landing to enable the wing to stall the sailplane on. Thus many fast and bad landings were made. 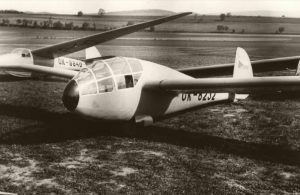 However, by changing the fuselage, Felix Kracht managed to solve this problem completely. The basic aim of the design is, in our view, to obtain excellent low speed characteristics thanks to a high lift, low speed wing section and excellent aerodynamics. To ensure a good performance at high speed with a high aspect ratio wing, with a wing loading that was high for the time and which produced a minimium induced drag. The ailerons, driven by direct drive, are very light and efficient. The elevator is also easy and effective. All these ingredients add up to a sailplane that is a real pleasure to fly a ship that is something very special and which must never be allowed to fall in unworthy hands. Flying weight 240 kg. 265 kg. Wing area 11.7 sq. m.
As the later Rheinland was heavier than the first production, one can imagine from the above figures, that its performance must be approaching that of the Skylark 2 / Ka 6 CR range.